S/V NAVIGATOR, our Island Packet 40 will soon depart Bermuda bound Norfolk Virginia. The student crew arrived on the evening of June 5th, and June 6th and 7th were spent in preparation for the voyage. The planned departure date is June 8th, but that may be delayed due to Tropical Storm Colin. The crew members are: Captain Tom Tursi (Skipper), Captain George "Nordie" Norwood (First Mate), and student crew members Ronald Heald, Samir Dobric and Don Chabon. NAVIGATOR will make the passage to Norfolk via a non-stop ocean route an estimated distance of 670 nautical miles, and may take approximately 6 days to complete sailing both day and night. See this for a summary of weather forecasts and narrative communications with NAVIGATOR prepared by Captain Steve Runals. Bradley Mabe, a Maryland School graduate and weather expert is providing weather guidance to the crew. We'll include his reports to the crew here, beginning with those relayed in advance of their departure. Here is the first. 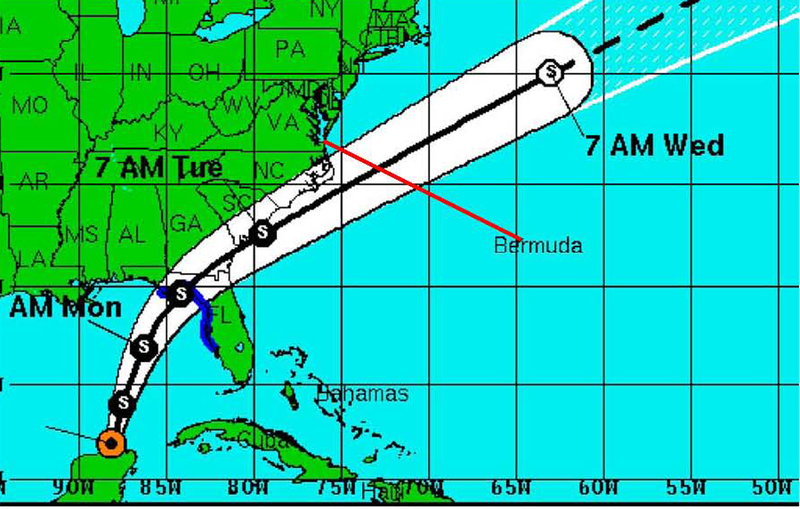 Tropical Storm Colin is NOT expected to become a hurricane. 6/7 - overnight - Winds S at 20 increasing to 30 Seas 6 to 10 ft.
TS Colin 5 PM position 36.5 N 72.2 W Movement NE at 40. Expect continued movement NE at 30 to 40 - strong Low pressure in the Canadian Maritimes will aid in continued course & speed. Winds 60 - We DO NOT anticipate any strengthening of this storm. Today we continued with preparations and completed just about everything for the cruise. We have been meeting at 0800 each day and will do so again on 06/08. We have completed boat checks and have been through the "Blue Book" [Maryland School Offshore Preparation Guide], and assigned student roles. The roles will rotate every 24 hours and we'll provide more discussions on this in a future update. We've completed food provisioning and the refrigeration system is chugging along cooling it all down. It is very windy at dock today and several boats are laying to waiting for the weather to settle. We have been going to too many expensive and fattening restaurants and are ready for a trimmed down sea diet. There is a high probability that we will have a delay in departure. We are looking at Thursday earliest. This will be subject to additional weather information tomorrow since it appears TS Colin has sped up and it is possible conditions will clear sooner. Crew is all well. First of all, thanks to Bradley Mabe for the weather report. Lots and lots of wind today at dock with 25-30 knots and gusts to 40. We had heavy rain in the morning then drizzling all day. The local forecast says conditions will moderate, and parallels Bradley's report. We are planning to depart at 10:00 AM. We need to clear customs, top off the fuel and water and get permission from Bermuda Radio to depart through the cut. With the expected wind direction from the WNW we expect to be on port tack and go north to clear the island, then make a decision once 20 to 30 miles from the island. One crew member left for personal reasons so we have five crew instead of six and have revised the watch schedule. We had a good day today and were productive with additional preparations, and feel well prepared for departure. We departed at 9:40 this morning and are sailing along nicely now. We had a foul up with the mainsail halyard which wrapped around the radar reflector up the mast. I [Tom] went up in the bosun's chair and cleared it. The procedure worked well and everyone did a good job. 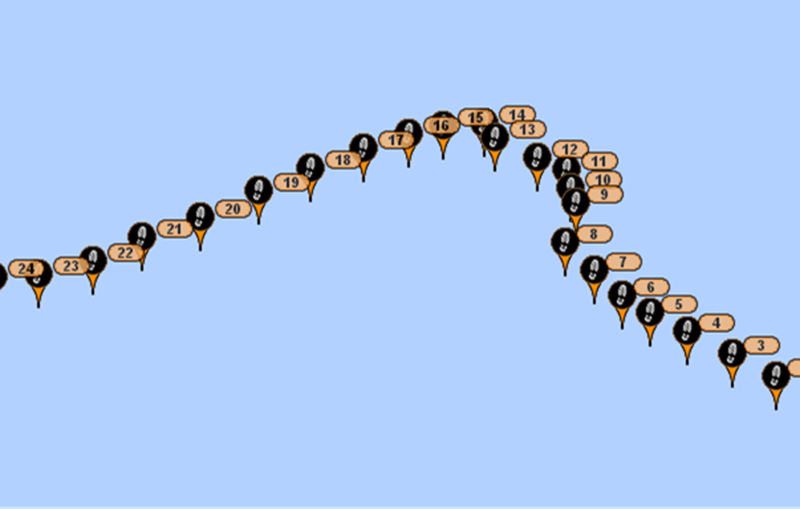 We are making nice headway going roughly north, sailing on a port tack with winds from the NW. We want to get well away from Bermuda before changing course. At this point we're approximately 35 miles north of Bermuda. This schedule repeats twice daily, so Nordie and i are each doing 6 hours on and 6 off as a result. Students will rotate through these positions every 24 hours. Tonight we had spaghetti and meatballs for dinner. Every one is doing well. There is some queasiness but no one is really sick yet! Thursday night was heavy duty with 25-30 knot winds overnight. Friday was more moderate with 15-20 knots from the NW. 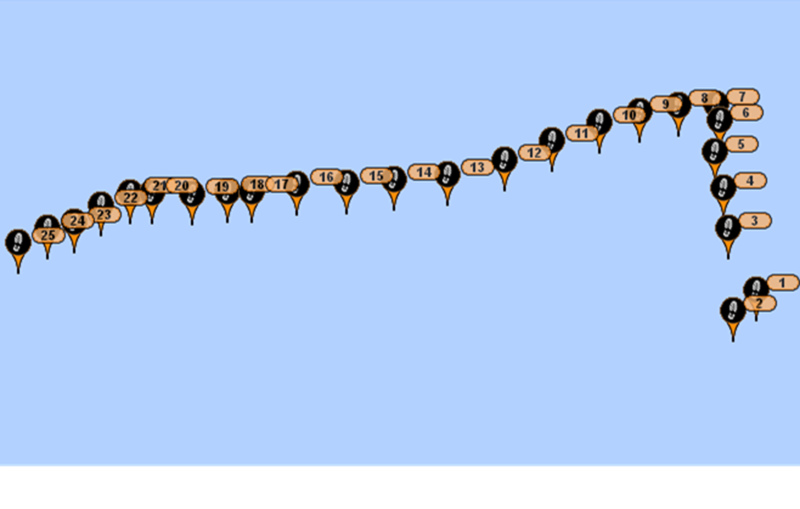 This morning, Saturday, winds are from the N and we're sailing on a line that would bring us close to our destination point, but the new forecast indicates that this will change. 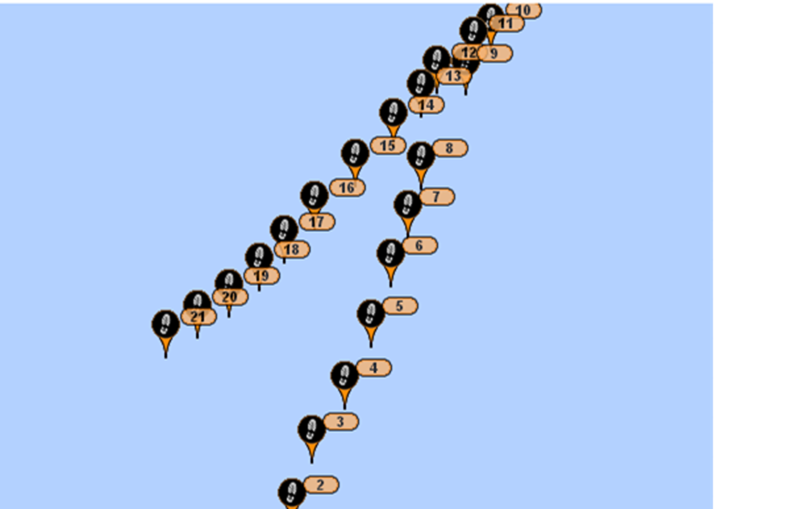 You can see from our track that we've been doing a lot of tacking. 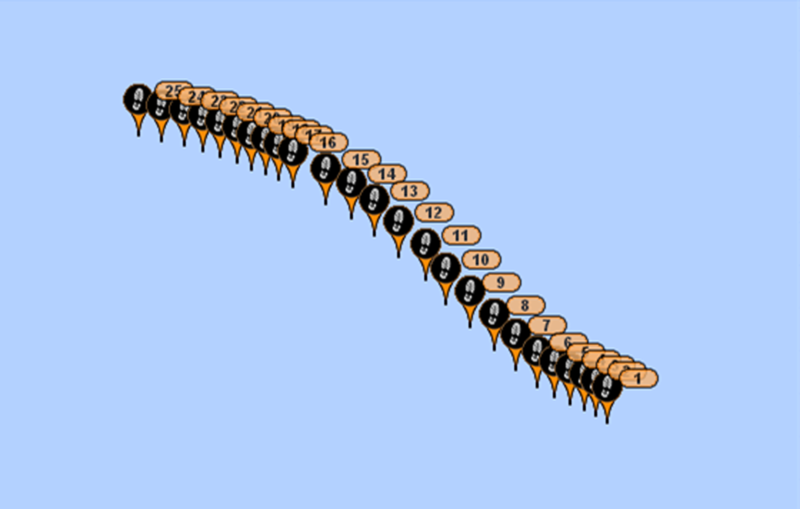 Judging from the forecast wind direction, it's going to be a slow trip. Everyone is doing fine and says hello. We're doing our normal shipboard routine and sailing the boat! 6/11 - evening, winds N at 10. Overnight, winds becoming NW 5 to 10. Continuing to back W then SW by Sunday morning. We had a beautiful sailing day today with lots of sun and 12 knots of wind. It was easy sailing and students took celestial shots. We had chicken stew for dinner and everything is fine. 6/12 - Evening - Wind SW 20 to 25 gusts to 30. 6/13 - Morning Wind SW 20 to 25 gusts to 30. At around 12Z (8AM EDT) a frontal system is indicated nearing your anticipated position from the NW. Rain and T-storms likely. After the frontal system passes 15z to 18z (11AM - 2PM EDT) winds become NW at 10 to 15 winds will back some overnight to the WNW. No tropical storm activity noted. We're in the middle of a gale now with 35 knots of wind and gusts to 45 knots. Everyone is doing well. We got Brad's report from last night. It's been pretty much right on, but with winds a little higher than that indicated. Midday today winds were 25 to 30 and they've been building toward evening and now we're getting 30 - 35. The waves are big but we have the mainsail reefed one reef and we have the jib down to a handkerchief size. It's pretty small, and we're actively sailing. We've reduced sail significantly in that manner in order to keep moving and control the direction of the boat relative to the waves. If we hove to, we could not do that, and would be more or less subject to however the boat turns. So this is a relatively comfortable arrangement that we have. We are moving 4 knots relative to the water and it's controllable. There are no waves breaking into the cockpit. We get spray now and then, but no waves and it's all pretty manageable. Everybody has a positive attitude. We had beef stew for dinner. We washed dishes in fresh water tonight. We don't usually do that. We usually wash them in salt water but it was too rough tonight. I just came off watch along with Ron and I'm about to call it quits for the evening. Nordie and Samir are on right now. It's going to be a long trip. With the forecast you just gave me from Brad tomorrow with winds from the NW we're not going to be making distance to our destination. For the past 24 hours we've actually been sailing directly towards Norfolk but we're going to have to tack off when the wind direction changes and then it's going to go back to SW so we'll be able to cut back. In any event, we're plugging away. New low pressure area forms just off the coast of North Carolina along a stationary front producing rain and showers and variable winds. The last 24 hours have been really rough. As we talked about last night, all day yesterday we had 25 to 35 knots of wind. It was clear early in the day and then it started clouding up and the winds increased. Overnight we had up to 45 knots and we were in survival mode, but we were sailing not hove-to. Everyone was doing fine but getting rained on and cold. The boat was sailing well under a reefed main and heavily reefed jib. Then about 4:00 AM this morning we started seeing lightening off in the distance in the direction we were going. By about 6:00 AM we had very heavy lightening and we ran into the trough that Brad had talked about and we had very, very heavy squalls and wind. And about 9:00 AM, the sun came out and it turned into a nice day with moderate winds of about 15-25 knots winds from the NW for the rest of the day. We just set a new waypoint for our target for the Gulf Stream entry and we're going to head towards that from our present position. We probably cannot make straight for it with the wind direction we're experiencing. This is our target Gulf Stream entry point about 15 miles or so south of Diamond Shoal Light which is off of Hatteras. We will then hopefully ride the Gulf Stream up to our exit point and then make our heading to Norfolk. We've finished dinner and everyone is fine and healthy and enjoying what is going on here right now. A key component of boating, especially offshore passagemaking, is understanding current and forecast weather and its implications. The crew needs to have an understanding of why things are happening now and what can or is likely to happen in the near and longer term. In addition to the shore based weather forecasts that Brad is providing drawing on a range of weather data from weather forecast models, observations from weather stations like ships at sea and analysis from meteorologists, they also draw from observations from their own eyes and ears. These deck level observations are recorded every hour by the on-duty watch. These include observations of wind, waves, clouds, barometric pressure and water temperature. These local observations help to identify trends and validate the information that Brad provides. Water temperature is important in identifying cold and warm water eddies that have broken off from the Gulf Stream and the Gulf Stream itself. Like the winds, these ocean currents are factors the crew will be taking into account. 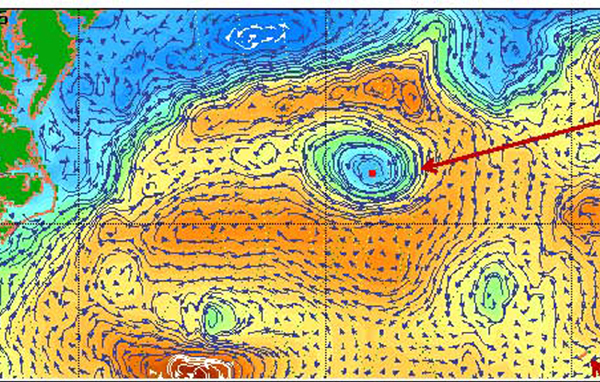 The following image shows NAVIGATOR's approximate position and one model’s depiction of those currents- one of which is quite large. Navigator; sounds like your are working hard under some very difficult conditions. You are getting close to safe and fair winds for the rest for the trip. 6/15 - Winds SW at 10 except variable (more W) North of Cape Hatteras. Becoming SW at 10 (even N of C. Hatteras) late afternoon and evening. Low pressure forms near NC/SC line and begins moving E bringing storm and squall conditions. Beginning overnight winds SW 15 to 20 increasing to 25 to 30 Thursday Morning and mid day N of C. Hatteras is a better place with slightly lower winds. the farther N the better. We finally have some favorable winds! The weather today was moderate and wasn’t bad at all. It’s actually been a rather docile day. As you see from our track we headed southwest quite a distance until the wind went from north of west to southwest and we tacked. We are now on a heading within 10 degrees of the waypoint we set up for Gulf Stream entry, so we’re in a good direction right now. From the forecast you just sent indicating southwest winds we should be making good progress on that. We are about 200 miles from the point of Gulf Stream entry which is about 15 miles south of Diamond Shoal Light. So our intention is to get into the Gulf Stream and ride it past Diamond Shoal and then turn to the N or NNW and pop out of the stream up along the Virginia Capes. We’ve had some head issues. We are managing that and we get some leakage when we use the aft head, but we’re being good soldiers, cleaning up after we use it, washing our hands well and using hand sanitizer. It’s a struggle to do that but everybody is doing it very responsibly. Students are getting some good celestial shots with the beautiful weather today and low wave action making for decent conditions to take shots. They’ve also done some plotting of celestial LOPs and have been working on running fixes and things like that. 6/16 - Winds SW at 20. An area of Low pressure over the Mid Chesapeake bay moves ENE and continues to bring a threat of showers & T-storms. Afternoon and evening, winds back WNW at 10 as the low moves farther E. Overnight, winds become N at 5 to 7 then become ENE at 10 toward Morning. First off, thanks to Bradley for the weather updates! Today was a fairly moderate day. We had some gusts that got up into the 25-30 range but for a very short period of time. For the most part we've been sailing generally westward toward the waypoint we set up for the Gulf Stream entrance. We're probably 50 miles from that point. It's very humid and we see in the sky a lot of moisture. We are doing fine. We had pasta and beans for dinner. We're 145 miles from the Chesapeake Bay, so we're expecting a Friday morning or mid-day arrival. The weather report is a little different from what we were anticipating so we'll have to evaluate that and it may have some effect, earlier or later, on our arrival time. 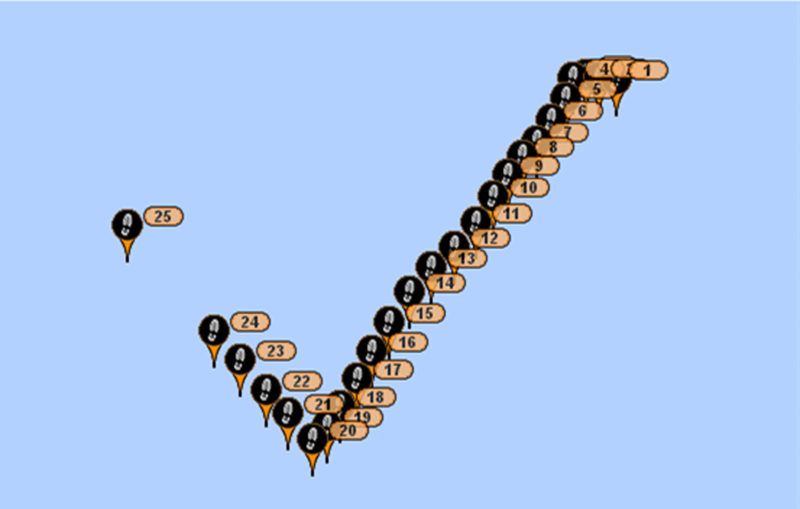 The following images from the SPOT Tracker show the actual route that we sailed for the entire cruise. Last night we had reasonably moderate weather with winds up to 25 knots which we are able to handle quite well. We entered the Gulf Stream about 9:00 PM last night and exited about 6:00 AM this morning. It's always challenging transiting the Gulf Stream. Sometimes the current opposes you and sometimes it's with you. Based on the route we set up we were in a very good position to take advantage of the favorable currents. We entered the Gulf Stream south of Hatteras and south of our rhumb line and it put us in a position where we could ride the Gulf Stream as opposed to swimming upstream. So that worked out well. We had a nice sunny afternoon after passing through some light squalls. This afternoon everyone has been taking celestial shots and other tasks they needed to complete. We're now 21 miles from Cape Henry and we expect to be at the marina in the wee hours after midnight. The image below is taken from our onboard chart plotter with arrows and notations added. You can see the mid-Atlantic coast of the US and Cape Hatteras. The Red arrows represent the northeasterly flow of the Gulf Stream averaging 2 to 3 knots. The Purple line is our desired course to the Chesapeake Bay entrance. 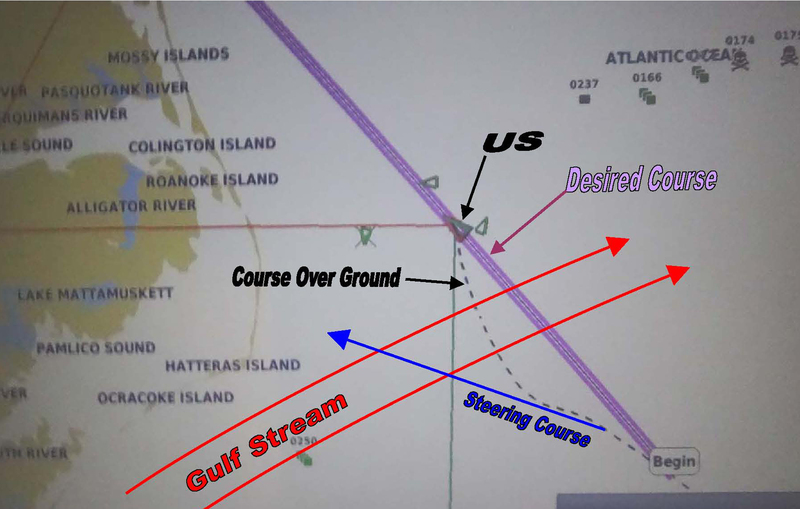 The Blue line is the course we steered toward our targeted Gulf Stream entry point. The Dashed line is our actual course achieved over ground as indicated on the chart plotter based on GPS. The difference between course steered and course achieved over ground was about 50 degrees due to the push of the Gulf Stream across our course. By steering west of our desired course before we entered the Gulf Stream allowed us to compensate in advance for its expected push to the east. On Thursday June 16, after crossing the Gulf Stream, we headed directly for Norfolk and the Chesapeake Bay. Winds were SSW and favorable for our route. Skies cleared and winds moderated to give us a delightful day of sailing and a great opportunity for taking celestial shots for which all participated and achieved good results. We also prepared our arrival navigation and piloting tasks and assigned crew members to the various essential duties needed for a safe and efficient transition from sea-rhythm to coastal-rhythm where our focus needed to change from long distance, open water sailing to close-in coastal sailing where other vessels are closer and events happen more quickly. Toward evening, skies clouded and we motor-sailed to accelerate our progress toward completion of this already lengthy cruise. After sunset, it became very humid and a light fog or mist settled in reducing visibility to about a half mile. About 2100 hours, we commenced piloting duties as previously assigned with Ron serving as Navigator working at the Nav Station below decks and working with the paper charts and Light List and confirming positions and progress using the chart plotter and radar and checking on other vessels using the AIS. Samir was on Helm, and Nordie, Don and I were visual observers of traffic and NavAids taking magnetic bearings when feasible and communicating continuously with the Navigator below deck. Around Midnight, it began to rain as we approached Cape Henry and entered the restricted Pilot Area where ship Pilots boarded inbound ships. It was interesting to see the Pilot transfer boat zipping out at 22 knots from their homeport even in these limited visibility conditions. As we entered the Thimble Shoal Channel inbound auxiliary channel, AIS showed an inbound large container ship approaching us from astern where she overtook us as we neared the Chesapeake Bay Bridge Tunnel passing within 100 feet to our port side. About 0400 on Friday 6/16 we entered Little Creek harbor, homeport of the US Navy's Atlantic Amphibious fleet and proceeded to Vinings Landing Marina and our slip by 0500. We called US Customs and Immigration and they instructed us not to leave the boat until they boarded for inspection and interview of crewmembers, which they completed by 0700 allowing crew to depart promptly for flights home. An so the end of a pleasant, if long cruise with lots of new learning experience for all onboard. I want thank all of the shore-support folks who assisted during the ocean passage, and in particular Rita Hansen for her ever-steady support, and Brad Mabe for his excellent weather forecasts which were timely and on-target. Also thanks to all of the families and friends who monitored the cruise as your positive support was felt during the difficult times of the cruise.